See more objects with the tag figures, animals, women's fashion accessories, personal adornment, traditional, figurative, beads, woven, accessories, symbols, earth tones, neckwear, talisman. See more objects with the color grey darkgrey darkolivegreen or see all the colors for this object. This is a Necklace. It was made by Barbara Natoli Witt. It is dated 1989 and we acquired it in 2002. Its medium is nylon thread, bone, shell, gold. It is a part of the Product Design and Decorative Arts department. 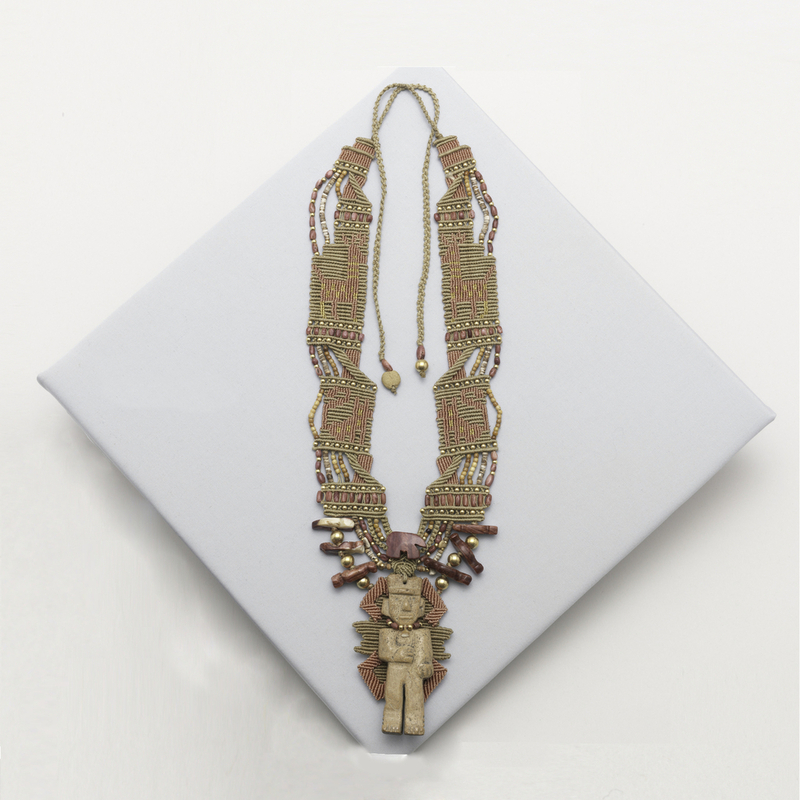 We have followed the development of the work of jeweler and fiber artist, Barbara Natoli Witt, and are now pleased to have the opportunity to add a group of her necklaces to the collection. 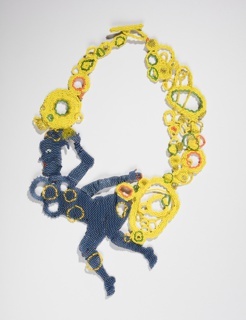 Her work is characterized by hand-woven or knotted collars into which she integrates antique beads and other ornaments. Witt studied fine art and graphic design at Cooper Union, and art history at Berkeley. She became interested in textile techniques and taught classes in weaving, rug design, lace making, and macramé in the Bay Area, where one of her students introduced her to a collection of antique beads. Soon after, Witt began to incorporate beads, talismans, and amulets into the broad, woven collars of her design. Witt’s neckpieces usually begin with a special ornament, or with the interests of a particular client. She works closely with both the object and her client. The whole composition, motifs, and color scheme of a necklace will revolve around the form and meaning of a central antique bead or talisman. Once the nylon threads are hand dyed, Witt chooses the weaving, knotting, or lace-making techniques to best complement the central ornament. Other beads or ornaments are subsequently chosen to strengthen the theme. Witt’s clients have included artists, politicians, fashion icons, socialites, and Hollywood celebrities. Among them are Diana Vreeland, Eleanor Lambert, Clare Booth Luce, Pamela Harriman, Dinah Shore, Marella Agnelli, Nancy Marks, and Beatrice Wood, a ceramist who created special ornaments for Witt’s pieces. Witt’s work would fit nicely into Cooper-Hewitt’s collection, bridging jewelry and textile design with its materials and techniques. The jewelry collection has other items that incorporate woven or knotted techniques, such as woven steel, jewelry with woven human hair or horsehair, and decorative buttons with lace covers. Witt’s work also relates to more contemporary pieces held in the collection at the time of proposed acquisition, such as the Vitamin Store necklace by Verena Sieber-Fuchs, made of pill casings woven into a broad collar, and a large Tony Duquette necklace with a bold collage-like assemblage of different elements. Eve Auchincloss, “Woven Jewels: Unique Creations By Barbara Natoli Witt,” Connoisseur Magazine, July 1989, 67–71. Anne Marie Schiro, “Gleams of Found Art Jewelry,” The New York Times, December 2, 1980. 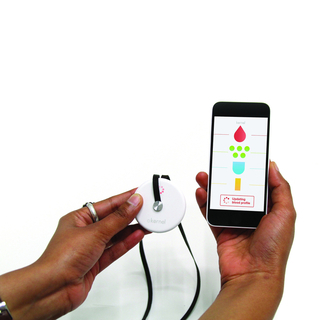 This object was donated by Peter Tishman and Lynn Tishman. It is credited Judith R. Tishman Collection, gift of Peter V. and Lynn P. Tishman. H x W x D: 34.2 × 24 × 1.5 cm (13 7/16 × 9 7/16 × 9/16 in.). Incised on small clay disk at end of right cord: "Witt" above "89".